Blogging for Books – Here there Be Dragons! and is proud of, the child reading it. This book is well written, beautifully illustrated, and just a bit too repetitive for my taste. It felt as though the author had a great idea and then pushed to hard, stretched too far, and made something that should have been beautiful and reassuring into something that felt forced and too long. Had the book been a few pages shorter, we (my daughter and I) probably would have given it 4.5 stars/dragons. As it stands, I give the book 4 dragons for the whimsical and adorable illustrations, and 2.5 dragons for the elongated storyline. Overall, we are rating this book 3 dragons. It is very cute and an interesting read for young children, but ultimately too long and redundant for my taste. Written for Middle Grade Readers (Ages 7-12/Grades 3-6), this book is an origin story, a fable, a history, a drama, a family tale, and much more. In this adorable story we meet and follow a boy who grows up to be Father Christmas. I read this via the audiobook (provided by Blogging for Books in exchange for my honest review) and the story is amazing, grabs you right off the bat and keeps you in its grips…and the narrations by Stephen Fry are so spot on it feels like the smoothest and most natural thing in the world. There are some difficult issues addressed within the folds of this story: loss of parents, extreme poverty, and violence…but along with that are the trappings of Finnish mythology, the impossibilities of life, and magic (LOTS of magic!). I am not the biggest fan of Christmas stories, they often seem to be formulaic and cheesy as all get out. This is not one of those stories. This is an adventure, a fable, a legend in the making. This is a story to listen to every year, for all the years. Haig has created a story with a life of its own, and I loved it. 4.75 dragons (stars) to this beautifully written phenomenon. Louise Miller, a pastry chef who knows her way around cooking up words as well, has created a yummy look at small time life and big time choices. Take her delicious descriptions, her cozy set up, and the charm that oozes in layers and add to it the slow melting chocolatey goodness of Jorjeana Marie’s voice and this is an audio book that will have you coming back for seconds! I don’t often read books in this contemporary, cozy, adult genre but this book drew me in and bade me stay to curl up with some hot tea and a piece of cake. a solid 4 stars to Louise Miller, I thoroughly enjoyed it. Written by John Elder Robison as a series of short stories from his childhood and meant to give the reader a peek into the Aspergian mind, this book is a mix of memoir, education, mental health, and even self help. Blurbed by Temple Grandin and Mark Roithmayr (president of Autism Speaks) and sporting a beautiful cover, be different draws the audience in and prepares them for some quirky fun as they learn more about Aspergers, a form of autism. When I requested, and was subsequently sent, this book for review from Blogging for Books, i was expecting something that looked more into the technical bits of Aspergian life. I saw that it was a series of advice/short stories and was honestly expecting to see articles, anecdotes from other Aspies (Robison’s word for those diagnosed with Aspergers), and maybe even some notes from a teacher or two. However, this book was not at all what I expected. While I was looking for the ‘advice’ part promised to me in the title, what most of the book entails is actually the other part, the part where he details his own adventures with Asperger’s. Except Mr. Robison was not diagnosed until his 40s. Which means that the stories we get in this book are actually told to us as an acknowledged Aspergian looks back at his childhood and discusses what happened in the light of having NOT KNOWN he was Aspergian. Sound confusing? It isn’t really. What Mr. Robison does well in this book is, among other things, detailing what he did and what happened to him and then spending a sentence or two describing whether that was or was not a good way to handle it in the light of Aspergers. However, Mr. Robison only mentions females as ‘girls’ to be learned about, feared, and, hopefully, dated. The only instance of women otherwise mentioned (besides offhand mentions of his mother) were of Little Bear, his son Cubby’s mother. She also has Aspergers…but he offers no advice or comments TO females. In fact, all of his stories and advice is written with an obvious slant to males. While this is understandable since he is, in fact, a male, AND the advice is applicable to both genders, someone with autism might not feel they ‘belong in/reading’ a book that doesn’t mention their gender. As someone dealing with a form of autism, I felt that he should have known and dealt with that at some point. He is also very self involved, which is typical for Aspergians and comes across well. I haven’t decided, and likely never will agree with myself, on whether this is frustrating, annoying, and a poor writing choice (especially in the times when he completely condones physical violence and leaving schools) or if it is necessary. On the whole, I found this book to be well written and interesting. Though I would have liked more advice and possibly less repetition on the themes, I feel like this is a solid book for helping teen Aspies, Prot-Aspies (people with traits but not full on Aspergers) and Nypicals (neuro-typical or non-autistic people) understand how to handle their side of the spectrum and possibly how to help others. I am rating this book a 3.5 out of 5 stars. The book jacket and interior photographs are glossy, well set, and mouthwatering. The hard cover itself is very classically designed and reminiscent of the type of retro cookbooks one might find in Grandma’s kitchen. The book blurb is well written and uses a few scientific phrases to really sell the idea of eating correctly for mental and emotional health. The book itself has beautiful images, well written recipes, and chapters full of essays explaining how each food can affect things such as memory, mood, and even ADHD. However, due to the heavy use of scientific phraseology and recipes that did not veer toward the norm for my area (there were few recipes that included ingredients that could all be found in my town, let alone my own pantry!) I am giving this cookbook a total of 3 out of 5 possible dragons. A Division of Penguin Publishing House LLC, New York. This book is a short work of fiction billed as a thriller and suspense story. With 62 pages and no chapter or section breaks, the plot moves forward at a snappy pace. Gillian Flynn’s writing is smooth and witty, the first person narrative carrying us through as though we are sitting across from the main character, sipping tea and listening to her story. What a story it is! We follow a ‘psychic’ as she goes to cleanse a poor mousy woman’s house, thinking that she will smudge a few herbs and wait out whatever hormone was messing with the teenage step-son. This doesn’t seem to be the case, however, and we quickly discover that there is more going on than meets the eye. The Grown Up by Gillian Flynn is a well written book with a gorgeous cover jacket, a minimalist but beautiful design for the hardcover and interior papers, and well developed characters. With the short amount of time you spend in the world of this story, having characters you identify with and can see on many levels is a great feat for the author. Unfortunately, this book was billed as a thriller and suspense novel but I did not find myself feeling much of either emotion. In fact, the most I felt was concern for the characters. Because of this, I am giving the book cover and design 4 out of 5 stars and the story itself 3 out of 5 stars. A division of Penguin Random House, LLC, New York. I have made mention before of how much I love the ‘new’ idea of adult coloring books. 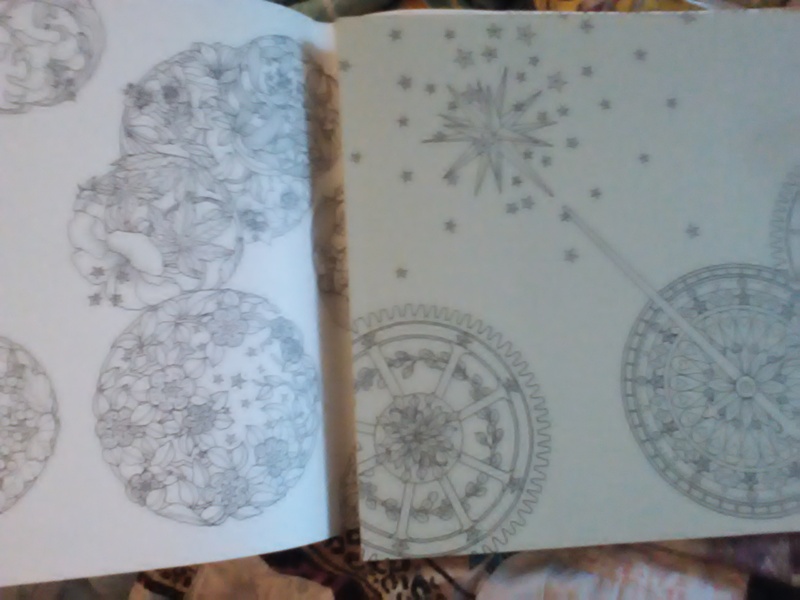 In fact, I even reviewed the first book in this coloring book series, The Time Garden, which can be found here. Well folks, Daria Song has done it again. This book is gorgeously drawn, beautifully storied in a few short sentences, and incredibly imaginative. A fairy who lives in a cuckoo clock decides to venture out into the world of her friend, the little girl. Suddenly the most innocent and mundane of items turns into magic and the audience is taken on an adventure chronicled through images that make you wonder even in black and white. I cannot wait to begin coloring these books…although I almost want to leave them in their pristine condition. The inclusion of the audience in the story, through the ability to color the story itself, reminds me of the beloved books from my childhood in which we chose what happened and turned to the appropriate pages. This grown up version, however, is so much better! Even the book jacket reveals a large illustration to be colored if one so desired. With owls on almost every page and the only real direction the inclusion of the fairy’s hair color, each individual will come away with an entirely different take on this picture book for adults. Color it in yourself, pass it along to a friend or loved one, give it to a child on the street…I cannot think of anyone who wouldn’t appreciate this book on some level, unless it they are blind. In fact, describing the pictures and reading the short sentences to someone who cannot see might actually allow them to appreciate it as well. I give this book 5 out of 5 dragons. I am excited to see what Ms. Song comes out with next. Whatever it is, I am sure it will be beautiful! I am so excited to bring to your attention today a truly interesting journal. Now I know that some of you might be thinking, “But I don’t journal!” or maybe even, “I don’t like to write!” (*shudder*) That’s ok! 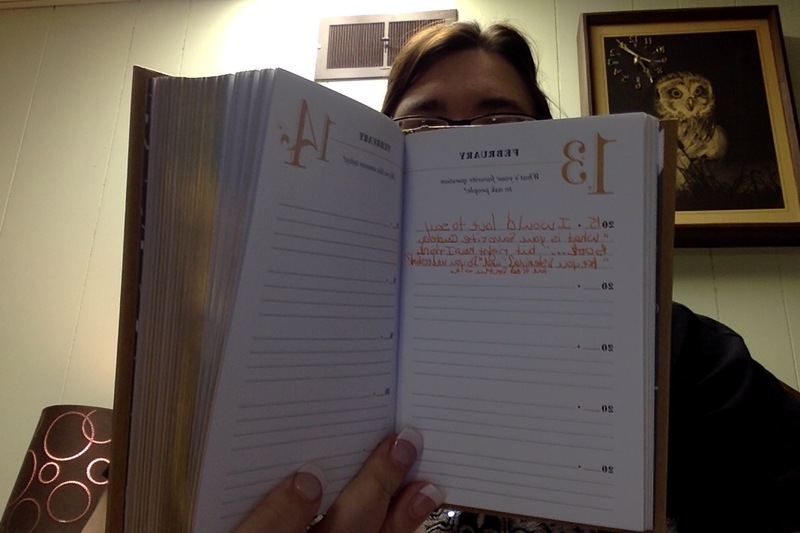 This journal is built for quick, short, and to the point responses! just about 4 lines per year…5 years per day! The perfect place to catch snippets of your life and how things change! Q&A a Day by Potter Style is not just a fun and interesting take on journaling, it is also comes in an elegant and handy cover. The hard bound burlap colored book (designed by Danielle Deschenes) is approximately 6″ x 4″ and sports beautiful gilt edged pages. The text design by Judy Stagnitto Abbate is, in my opinion, the perfect mix of elegant classicism and modern sass, creating a very modern retro vibe that can be comfortably carried in a handbag or left on a bed side table. Cover Photo for an absolutely intriguing journal! I am very much looking forward to seeing how my answers change and evolve over the next five years…and with questions like “Who was the last person to make you angry?”, “What’s the Most Creative Thing You’ve Done Recently?”, and “What’s your favorite accessory?” I can’t help but feel like this will be a treasure to keep for more than just the next five years! This may be an item that can, once filled out, be passed on down through generations because, regardless of writing talent, it will offer tid bits about Mom/Dad or Grandma/Grandpa (Or even great-aunt Jo) that may never come up in general conversations! I give this book a heart-felt 5 out of 5 dragons for both cover and content! 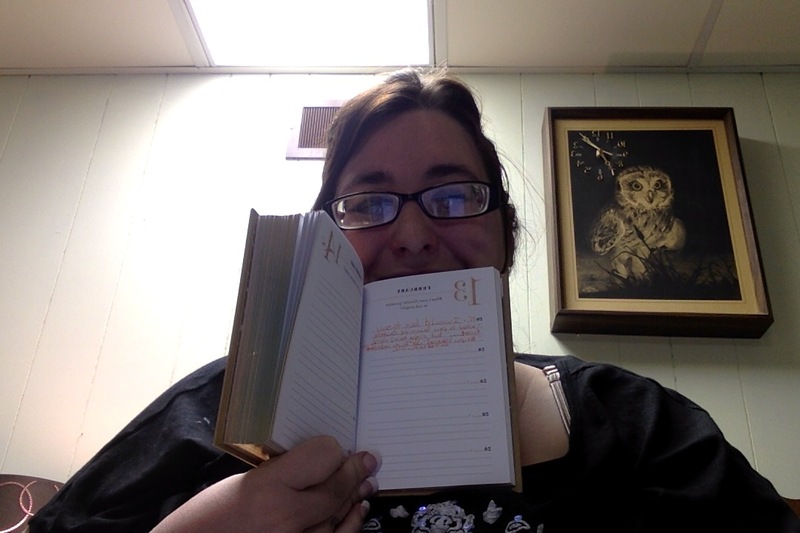 Hurry and go grab your own: You start on whatever day you get the journal and just keep going! Hope this review was helpful for you! Have a marvelous and Blessed Valentine’s Weekend 2015! *Full Disclosure* I received an e-copy of this book in exchange for an HONEST review. My initial reaction to this book was a lot of mixed feelings. As someone who has been labeled as highly intelligent (read…smarty pants) my entire life, I didn’t want to be told that other, non IQ related, parts of my brain could be more ‘real world’ specific. But the more I looked at the book, the more entranced I became. Creativity, emotions, even that odd thing called ‘intuition’ can be TRAINED and USED to improve real world success. Once I really payed attention, I decided this could work. Mr. Sundem breaks down the areas of the brain (or areas of thinking), explains aspects of each area in question, and then provides a few exercises to train your brain for that particular area of thinking. The exercises are fun and interesting brain workout while the reading sections intrigue me. I plan on going back to read this selection again soon! I give Beyond IQ 4 out of 5 dragons! Raising Cubby: A Father and Son’s Adventures with Asperger’s, Trains, Tractors, and High Explosives. John Elder Robison has written a beautifully worded tome that takes people through his life as a father with Aspergers…raising a son with the same. The dictionary defines Aspergers Syndrome as – noun, Psychiatry. a developmental disorder characterized by severely impaired social skills, repetitive behaviors, and often, a narrow set of interests, but not involving delayed development of linguistic and cognitive abilities: now considered one of the autism spectrum disorders. Change is difficult, minor issues become obsessions (poodle hair feels strange so I can’t pet my dog! ), and many parts of your day must be repetitive to keep you comfortable. Now, imagine having all of that and raising a child; a child who is also diagnosed with Aspergers Syndrome. This book allows you to take whatever shallow pseudo-understanding a person not suffering from being on the spectrum might have, and kick it up a notch (even those of us who have had a lot of interaction with the Spectrum aren’t going to ever truly understand it, each case is different and trying in its own right!). 2) If you were a completely, socially anxious person with trouble expressing yourself to the outside world and you wrote a book that is now available to that outside world…would you want people to pass it by? I wouldn’t…and I don’t think you should either! I give this book 4.5 out of 5 Dragons. Thank you Mr. Robison for sharing this story with the world! *As a side note, as doctors begin to understand more about the Autism Spectrum, changes are being made to the way people are being diagnosed, and handled, and teachers are able to learn more about how to teach those particular students.